Sharing a tutorial for this DIY Knit Pouf Pattern, as well as video instruction to help you make your own chunky knit pouf! Wow…it's been a while since I've picked up my knitting needles or crochet hooks! Truthfully, nothing was inspiring me and I had other things to keep myself busy. But I recently spied some square poufs/ottomans which provided ample inspiration to pick my needles back up. Let me digress here just a sec…can we all agree that ‘pouf' is a funny little word!? And it's so widely used right now, that I felt compelled to do a little ‘pouf' research. The word can apply to a hairstyle, a headdress, a gathering of fabric and a low, padded footstool. 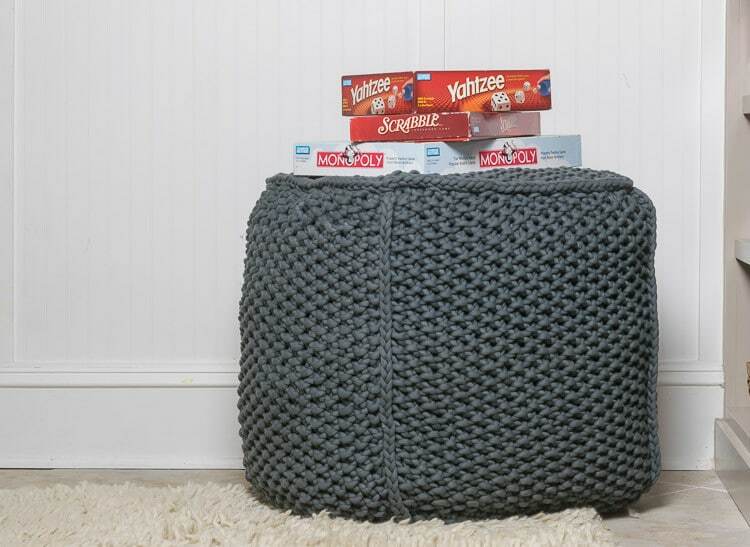 Since ‘low, padded footstool' is not nearly as fun to say as ‘pouf', let's march forward on our DIY Knit Pouf! But, all that being said, I don't want to exclude anyone who might prefer to call the pouf a knitted footstool or a knitted ottoman…or a knitted low, padded footstool for that matter. We are equal opportunity pouf-ists here. 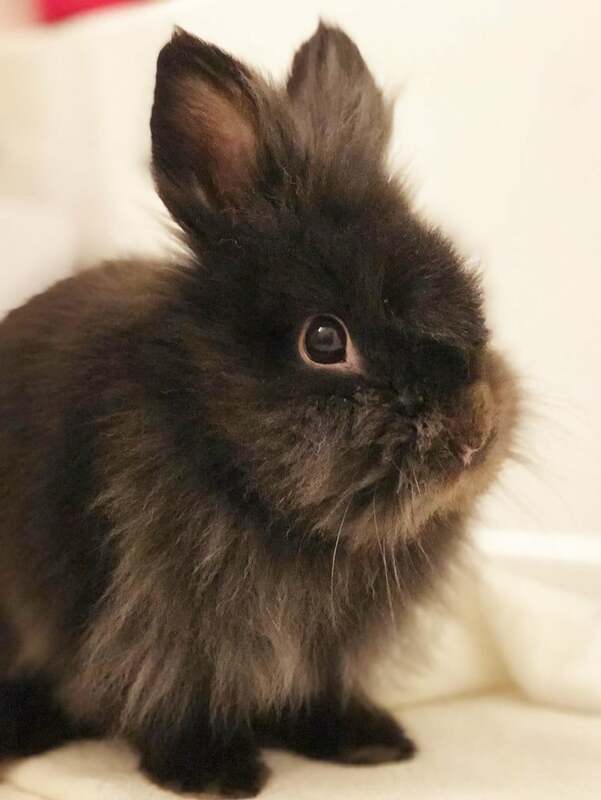 This first square pouf was made per the wishes of my daughter, who requested that I make it in a yarn that would blend in with her bunny Remie's gray fur. Luckily, we did find a yarn that fit that order and this pouf was made in short order. Just a reminder…all subscribers to Nourish and Nestle have access to the printable PDF of all knit patterns. Access it here or Subscribe here. Fill. I used a 5-lb box of Poly-Fil. 60″ of fabric, at least 40″ wide. I found a fabric that blended with my yarn, but you could always find a contrast instead. If you would like a pouf of a different size (not to be confused with a horse of a different color! ), I've calculated the yardage needed for a variety of sizes and the number of stitches to cast on. And bear in mind that once you stuff your knitted footstool, it will be slightly bigger than the size you knit. How much yarn do you need for your Knit Pouf? How many stitches should you cast on? Cast on 24 stitches and using the seed stitch, knit until work measures 19″. Cast off. The seed stitch is a basic basketweave stitch achieved by alternating knit and purl stitches. You can always tell which stitch you should work by working the opposite of the one below where you are on the previous row. Repeat this 5 more times, until you have 6 knit squares. Pin the lining fabric to the knit fabric and sew the lining to the knit square on the cast-on and cast-off edges. The knit fabric will want to stretch more than the lining, so be mindful that your 2 layers are lining up. Have your knit fabric facing down, with the lining fabric against your sewing machine foot, otherwise, the sewing machine foot will get stuck in the knit loops. Go slowly and pull your fabric through from the back…your feeder might not be able to feed the thick fabric. If you go too fast, you are likely to break the needle…ask me how I know. Once you have the lining sewn to all 6 pieces of knit fabric, attach 4 pieces together along the (unseamed sides), to form the square base of your knitted ottoman. When you have the base sewn, attach one of the remaining 2 pieces to the four sides to form the top of the pouf. The thickness of 2 knit pieces will make it very difficult to turn the fabric at each corner. Instead, after you end each side, lift your needle and move it to the next side, making sure the needle lines up at the end of the previous seam. Repeat this process on three of the sides for the bottom of the pouf, leaving one side open to stuff. Stuff with PolyFil and sew up the seam using a crochet hook to thread the yarn through the stitches. The 5 lb box of Poly Fil ALMOST filled my pouf, so I used the stuffing from an old pillow to add a bit more instead of running to the store. If you sized down your pouf an inch or two on each square, the 5 lb would probably be just fine. For what it's worth, I tried the little ‘beans' for bean bags and ended up with a ‘blob' as opposed to a pouf. Using a crochet hook and a piece of the yarn, weave the opening closed. Make icords to finish the seams of the pouf. I made 4- 2 stitch icords 19″ long and 2 more 2 stitch icords approximately 22″…just measure along your top seam to make sure you have a long enough icord to go all around the top and bottom. Using your US19 circular needles, cast on 2 stitches. Making sure your working thread is on the left side and in back of your 2 stitches, knit those two stitches. Slide those 2 stitches across your circular needles so that your working yarn stays on the left and in the back of your work and knit the stitches again. By keeping the working yarn in the back, you will form a tube when you pull it across the back. Repeat this process as many times as you need to get your desired length. Cast off and weave both tails into your icord with a crochet hook. Sew the shorter icords to your cube to cover the side seams and then sew the longer icords along the 4 sides of the top and bottom, covering the ends of the shorter icords as you go. And that my friends, is a wrap! This really was an easy project. The squares knit up quickly and the sewing the knitted footstool was easy…but you just can't rush that sewing machine needle. And click on the little arrow on the image below for a quick snippet preview of the knitted ottoman in progress. If you think you'd like to refer back to this DIY Knit Pouf Floor Cushion Pattern in the future, then, by all means, bookmark this page or pin the following image. Thanks again for spending a few minutes of your busy day with me today.Please know that I welcome each and every comment that comes my way. If you want to make sure you don’t miss future content, pop your email in the beige box up on the right or click here. I usually send out 1 email a week, so I won’t inundate your inbox…believe me, I’m sensitive to an overflowing email inbox!